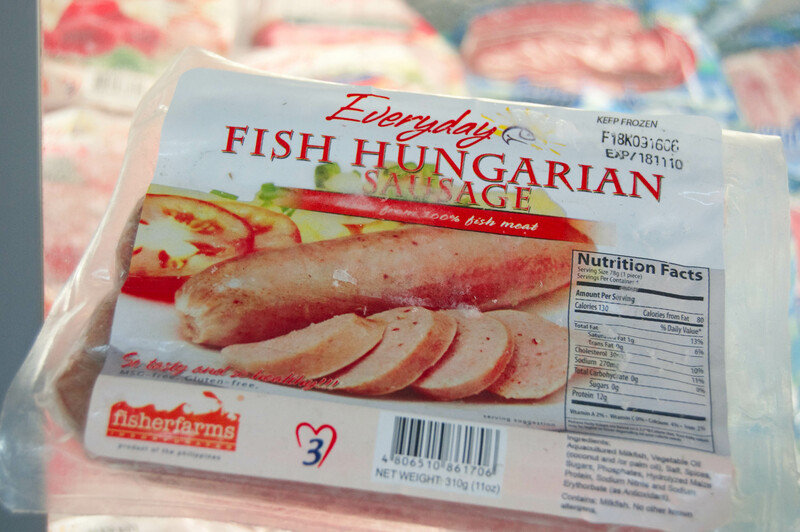 Perfect for the Lenten Season, these fish hungarian sausages better make its way to your pantry soon. These sausages aren’t one of those meat-product-forced-to-be-healthy-therefore-should-be-made-into-fish thing (read: corned tuna!). The first time I sampled these, I was very impressed. It tasted very much like the REAL hungarian sausage. I liked the kunat component of the casing and the juiciness of the inside. I sure found a gold mine again! My friend remarked the other day, “Grabe, ang tyaga mong umikot sa grocery!”, referring to my latest find when I scoured the freezers of SM Hypermarket along Quezon Avenue recently. Finding Fish stuff would relatively be easy but to actually find the great-tasting ones would be a tall order. Okay, so what did I do? I did my favorite stir-fried sausages in my old-time favorite tomato-pepper sauce. I had a twist though– I smothered some mozzarella to it and it turned out even better! I did this dish in my recent cooking demo and the audience liked it during the tasting portion. Hope you would too! 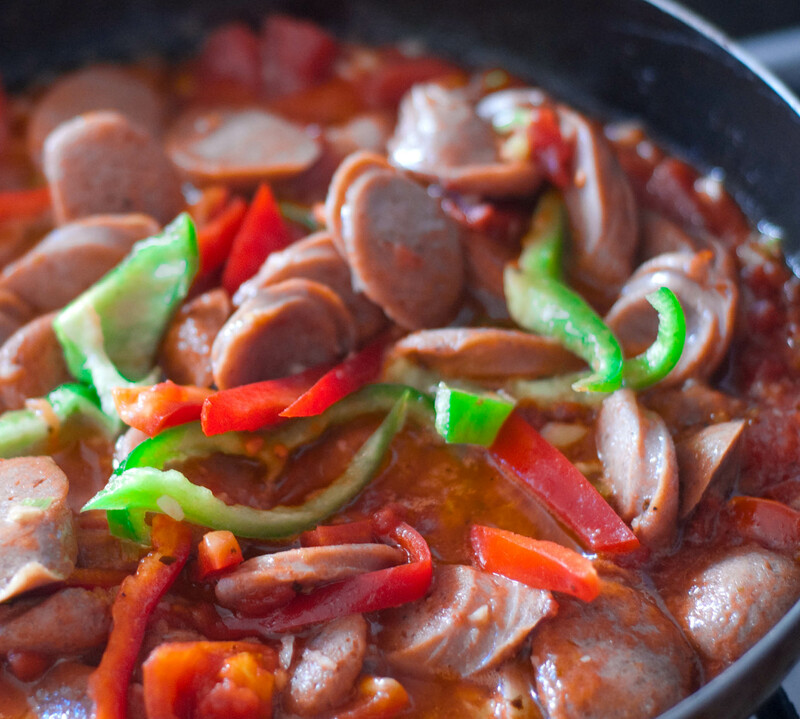 In a skillet, stir-fry sausages until lightly browned. Remove from pan and set aside. Using the same skillet and oil, saute onion, garlic and tomato. Add bell peppers and sausages. Season with salt and pepper plus the cayenne pepper. Stir in butter and tomato sauce. Simmer for about three more minutes. Using a microwavable plate, pour in some of the dish and sprinkle cheese on top. Heat on microwave for about two minutes on medium heat or until cheese melts. Where do you find these sausages? They’re from SM Hypermarket at the Centris Station along Quezon Ave. The brand is called “Everyday” and they have other varieties of their fish goods like the longganisa and another one (the name escapes me now). It’s very, very good! I’ve seen this Everyday hungarian sausage before in Robinson’s Suerpmarket but I haven’t tried it, I always pick King Sue products (not sure of the name). Thank you for sharing this recipe, I now have a reason to try & buy Everyday hungarian sausage. Yes, I saw a lot of these Everyday products at SM Hypermarket Supermarket. Mybe you can try try their other products as well. Thanks, Ethan! Yummy, right? Love it!